Cute! I love those cupcakes (I could use 4 or 5 right now *wink*)! I'd have a hard time biting into that beautiful cupcake. But, somehow, I think I'd manage eventually. ;-) My daughter and I were discussing last night if we thought we could lose 5 pounds in 3 weeks. That shouldn't be hard, but somehow it is. ;-) Thanks for the temptation. Adorable cupcakes!!! 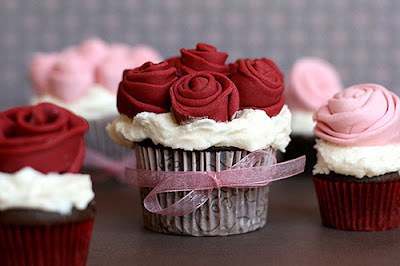 I would not want to eat them;they are soooo pretty!!! How cute are these...and calorie free? !